Panasonic's next-generation HD-PLC technology for IoT-related services was adopted as the IEEE 1901a standard. It allows scalable communications with speed or distance depending on IoT applications. Hiroshima University, National Institute of Information and Communications Technology, and Panasonic Corporation announced the successful development of a terahertz (THz) transceiver that can transmit or receive digital data at 80 gigabits per second (Gbit/s). 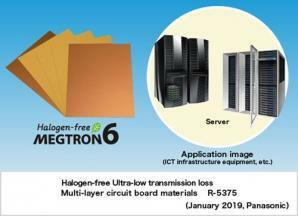 Panasonic's new halogen-free multi-layer circuit board material enables greater-capacity and higher-speed transmission of data communication, which will contribute to the popularization of 5th-generation (5G) mobile communication systems. Panasonic Corporation announced today that it will enhance its production and development functions for the substrate material MEGTRON GX, which is used in semiconductor packages and modules, in China and the North East Asian region. Panasonic Corporation announced today that it will accelerate initiatives to achieve a sustainable society by utilizing hydrogen energy through the application of its technologies developed for residential fuel cells. Panasonic Corporation has successfully proposed adoption to Taiwan Power Company of its HD-PLC high-speed power line communications technology as a communications system to utilize next-generation smart meters. 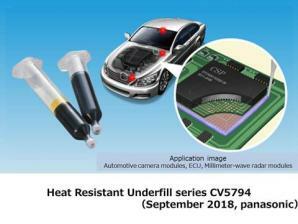 Panasonic's new underfill products increase the reliability of automotive electronic systems by reinforcing the solder connections between semiconductor packages and printed circuit boards to meet stringent industry requirements. Panasonic Corporation announced today that it has presented its fourth-generation scalable HD-PLC technology to IEEE Standardization Working Group. The specifications using this technology as the technical baseline have been approved as an IEEE P1901.3 Working Document. Panasonic Corporation announced today that it has developed a time-of-flight (TOF) image sensor that uses avalanche photodiode (APD) pixels and is capable of capturing range imaging of objects up to 250 m even at night with poor visibility. 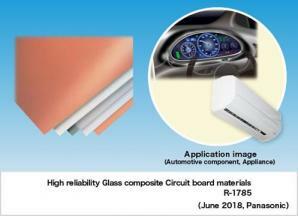 Panasonic's new glass composite circuit board material improves the mounting reliability of electronic circuit board parts, thereby contributing to the long-term stable operation of automotive and industrial equipment. 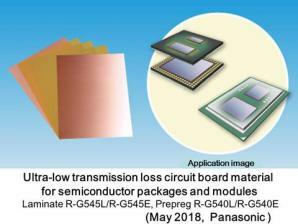 Panasonic's ultra-low transmission loss circuit board material for semiconductor packages and modules allows the stable operation of semiconductor devices that process enormous data at high speed. 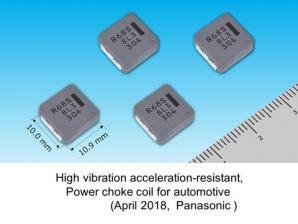 Panasonic's power choke coil for automotive use with the industry's highest resistance to vibration, contributes to more ECUs being placed within the engine itself and integration of mechanical and electronic in-vehicle components. The content in this website is accurate at the time of publication but may be subject to change without notice. Please note therefore that these documents may not always contain the most up-to-date information.